Hi idk if anyone can answer but I was wondering if there was a way to enlarge the font on your paragraphs in the TRP window. I use template 3 and the history area is so small I have to squint and lean forward towards my screen. I have looked at the settings but I don't see anything. Thanks in advance for any help. Hey. Last time I heard about font size issues, they were tied to another addon messing with the game fonts (ElvUI in that case). 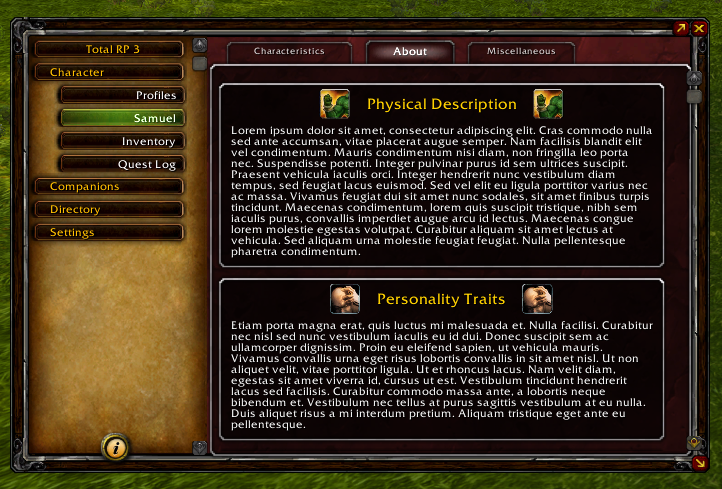 Make sure you don't have another addon changing font settings (and look into their settings if you do have one). I use bartender and Extra Chat font sizes mod. But I don't think they're causing it, since I have the font on my chat at 24. Does it look about the same (in terms of relative size difference) ? We'll try to take a look at it. Okay, just wanted to make sure there wasn't something we were missing, but I'll see what can be done. I just have a spelling error to report: in the french translation of "Relationship Status". Marrié(e) is spelled with only one "r". It should be "Marié(e)". Then i have a suggestion for a feature that probably might have been asked by others: The ability to add personal notes on everyone's profile. Doing TRP objects or holding one huge .txt file or several small ones is kinda tedious. So i thought an extra "tab" at the end someone's profile (one you can edit) would be very useful to remember details and specifics about someone (for the poor of us with a bad memory). Thanks a lot for everything and keep up the excellent work! Hey ! I was informed of the typo soon after it was released and it's already fixed in localisation, so next version will be correct. Personal notes have been on the suggestion list for a while, I've been looking at it recently, so it might finally happen soon™. Hello! Would it be possible to add a "Not interested" and "Engaged" option for those soon to be wedded in the relationship status? Hi, I don't think we're considering either of those. Engaged is technically covered by "Taken", and you can use the "Accept character romance" dropdown in the Miscellaneous tab to inform whether or not your character is interested in a relationship. Hello hello. I have a request that is probably a lot of work to implement! I'd like a different set of at-a-glances for druid shapeshift forms - potentially swapping automatically when you shift. How possible is that? You can save glances and reload them using the menu when you right-click on one, which might help with keeping different glances. As far as automatically switching, it was a plan at some point but I cannot tell when this will get added. It will require a bunch of technical work to implement and early work done on it has been scrapped. I was just wondering, will you be able to add the new icons and images from the Darkshore warfront soon? Thank you! Thanks, I’m glad you like it :) The next update will have the new resources from patch 8.1, icons, images and sounds. Locals: (*temporary) = "AddOn_Chomp.NameMergedRealm(): name: expected non-empty string"
Hey, we're aware of the issue and will have it fixed for next version ! Is there a way to have the RP names appear for additionally created guild channels? For example in my guild we use normal guild chat for ooc stuff, and created a seperate channel for IC to keep things organized, but the new channel doesn't show RP names. You need to update, this issue is fixed in version 1.5.1 and 1.5.2.